Google Earth puts a planet’s worth of imagery and other geographic information right on your desktop. 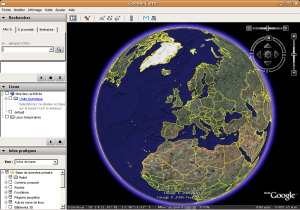 Google Earth is a free software download from Google that allows you to zoom in to see highly detailed aerial photos or satellite images of any place on the planet earth. Google Earth includes numerous layers of professional and community submissions to assist the user in zooming to see interesting places. Get driving directions, tilt and rotate the view to see 3D terrain and buildings, save and share your searches and favorites and even add your own annotations. You can still zoom around the earth, select layers, and submit eye-level photos served up courtesy Panoramio. However, you cannot access the full search or other databases or make use of the fantastic PC-version tools and special views. One item unique to the app is a menu of nearby iconic images that you can tap for quick access. Intuitive and fun 3D globe. Many ways to fly. Layers have content from users and Google partners. Enjoyable extras such as flight simulator and Google Sky. Rich location-specific photography including high-res panoramas.